Planning your meals ahead of time can make dinner quick and easy. Here are some great ideas for weekly meal planning. You may have heard of family meal planning or perhaps have been wondering what the fuss is all about. Well, to put it simply family meal planning means planning your family’s meal to help you save time and money. But beyond saving time and money there are some other great reasons for family meal planning. By planning your meals and doing your shopping ahead of time, it’s easier to make sure your family eats healthy and balanced meals. It’s too easy to reach for the phone and order a pizza when everyone’s just gotten home from soccer practice and your fridge is empty. First, look through your pantry and cupboards and make a mental note of what you have. The see if there are any foods you can use to plan your family’s meals around. For example if you have pasta or rice then create a couple of meals including those staples. Then sit down and plan your week’s menu. Write down each dinner and remember to make allowances for days you don’t have a lot of time or get home late. If you know ahead of time Tuesdays are stressful then plan something pretty simple to make for that day or even make double on Monday and save the leftovers for Tuesday. You can vary the meal by changing one or two things around. Once you have your menu write a shopping list while checking your pantry, cupboards and fridge again to make sure you’re not buying something you already have. Then add items you’ll need for breakfast, lunch and snacks. You may not necessarily plan these meals but just make sure you include enough of the foods you usually need on your list. Although going to the supermarket once a week is a good way to save time and avoid overspending, it may not always be possible for all items. If you buy a lot of fresh fruits and vegetables you may want to only include half a week’s worth of items on your list and make a second quick trip during the week for the rest. Just stick to the produce isle to avoid temptations. When planning your list think of meals that are both nutritious but frugal. Casseroles, stews and pasta dishes can be quite inexpensive and also easy to prepare. To save money, include one or two vegetarian meals a week. You can make a nutritious meat-free chili or cheesy pasta bake. Tuna is another great frugal food you can add to pasta or rice dishes. When you’re buying your vegetables plan your meals around them to avoid wasting food. Say you buy a bag of carrots then try to include carrots in several dinners or use them for snacks to avoid ending up with a fridge full of expired produce at the end of the week. Think ahead and use your freezer. If you’re making something that freezes well like spaghetti sauce, a stew or casserole make double and freeze the second portion for those days where you just don’t have any time to cook. Finally, don’t forget to stick your menu on your fridge or other prominent place and plan ahead every day. If you’re making a crock pot stew you can cut the veggies the night before and add them to your crock pot in the morning. Leave your meat thawing in the fridge during the day and leave the items for the evening’s dinner out so that you can easily start cooking once you get in. Stop Feeding Your Kids Junk – Start planning your meals ahead of time. 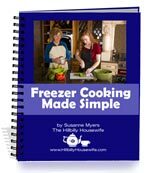 Grab your free meal planning guide at MenuPlanningCentral.com. You can even signup to get 3 different types of menus (family -friendly, healthy and vegetarian) each month. Give it a try!